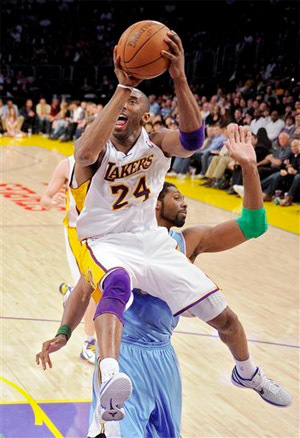 Kobe Bryant forcing his way for a shot against Nuggets. The Lakers played sloppy, shot the ball poorly, Pau Gasol hurt his knee, and they lost the services of Andrew Bynum late. All of that added up to a disappointing 95-90 loss to the Denver Nuggets on Sunday afternoon at Staples Center. Kobe Bryant scored 28 points, but shot just 10-27 from the floor, and was clearly bothered by the Nuggets’ aggressive defense against him, and the lack of foul calls. His frustration boiled over and he picked up his 13th technical foul in the second quarter after slamming the court with his hand after a missed shot. He also missed several shots in the fourth quarter, including a key baseline jumper in the final moments with the game still on the line. The Lakers also got a huge scare when Gasol went down clutching his knee after taking a hard foul on a made basket in the third quarter. He briefly went to the locker room, but did return to finish the game. Team officials have said he will have a precautionary MRI on Monday. Gasol finished the game with 16 points and 12 rebounds, but clearly didn’t have the same impact on the game after injuring his knee. Bynum also left the game Sunday with seven minutes left after tweaking his knee on a collision with Lamar Odom. He appeared to grab his knee on the bench, but said after the game he was fine and expects to play on Tuesday against Utah. He scored eight points and grabbed a game-high 16 rebounds. The Lakers led 47-40 at halftime in a very uneven game, with neither team shooting the ball well. The second half was a grind, the Lakers held the lead late in the third until Denver went on a run, and briefly grabbed the advantage. The score was tied at 69 at the end of the quarter. The Lakers opened up a 75-69 lead early in the fourth, but the Nuggets took over from there. Point guard Raymond Felton scored all 16 of his points in the second half, including several key buckets down the stretch to keep Denver ahead. With Denver up 91-83, the Lakers scored four straight and had the ball with under a minute left, but Bryant missed a tough baseline shot. The Nuggets split two free throws to go up 92-87. Odom, who had 17 points and seven rebounds off the bench, hit a three-pointer with 16 seconds left to bring the Lakers to within two. After Nene made his first free throw, he missed the second, and Kenyon Martin forced Odom under the basket to grab the putback, which effectively closed the door on the Lakers’ winning streak. For the game the Lakers shot just 42.9% (36-84) from the floor and 4-18 (22.2%) from beyond the arc. They outrebounded Denver 45-44, but were undone by the 20 turnovers they committed. The Nuggets shot just 43.9% (36-82) from the field themselves, and turned the ball over 17 times as well. Danilo Gallanari led the Nuggets with 22 points and seven rebounds. Kenyon Martin had 18 points and eight rebounds, and Nene scored 12 to go along with seven boards. The loss dropped the Lakers 2.5 behind the Spurs for first in the Western Conference with six games left. The Lakers are now 17-2 since the All-Star break. The champs’ next game is Tuesday night at Staples Center against the Utah Jazz, who were eliminated from the playoff race on Friday by the Lakers. After Tuesday’s game, the Lakers go on the road at Golden St. on Wednesday, and then Portland on Friday. 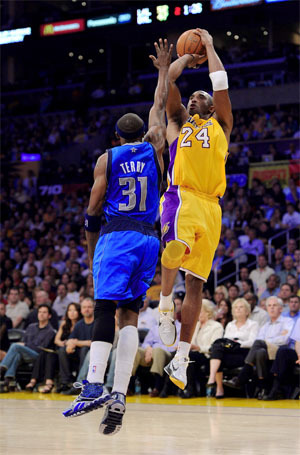 Kobe Bryant takes a jumper against the Mavericks. There were five ejections and four technical fouls at Staples Center on Thursday night, but nothing could stop the Lakers methodical second half romp over the Dallas Mavericks 110-82, as they won the battle for second place in the Western Conference. Kobe Bryant scored a game-high 28 points, and Andrew Bynum had 18 points and 13 rebounds as the Lakers moved their record to an NBA-best 16-1 since the All-Star break. They’ve also won eight straight. In a playoff-like atmosphere, with the Lakers running away in the fourth quarter, the Mavs’ Jason Terry pushed Steve Blake under the basket, sparking a skirmish between the players on the court. Matt Barnes, Blake, Terry, and Brendan Haywood were all ejected, with Terry picking up a flagrant-2 foul. Minutes later, Shannon Brown was ejected after another shoving match that followed a hard foul on Pau Gasol with the game well out of reach. Neither of the incidents could take away what was a dominating performance by the world champs, who held Dallas to just 31 points in the second half, including closing the game on a 19-2 run. The two teams could face each at some point during the playoffs. Gasol chipped in with 20 points and six rebounds, and Lamar Odom had 16 points and 11 rebounds off the bench, scoring 11 straight points at the end of the third quarter and the beginning of the fourth, that turned a 79-70 game into a 90-70 lead. Ron Artest poured in 13 points. The Lakers led a tight game 54-51 at halftime, and then slowly started to pull away late in the third quarter. After Odom’s 11-0 run late in the game, Dallas responded after the first flare up to get to within 91-80. Bryant was reinserted into the game to restore order, scoring six straight points and the game was never close again. For the game, the Lakers shot 44.7% (38-85) from the field, and hit 28-39 (71.8%) from the foul line. They outrebounded the Mavericks 52-47, and committed just seven turnovers. Dallas shot a woeful 36.1% (30-83) from the floor, and a miserable 6-26 (23.1%) from beyond the arc. They scored just 12 points in the final quarter. Dirk Nowitski led the visitors with 27 points and 13 rebounds, one of only three Mavs in double figures. Peja Stojakovic had 13 and J.J. Barea had 10 points off the bench. Before getting tossed from the game, Terry hit just 2-9 shots for five points. Nowitski was clearly the lone bright spot on this night. The win put the Lakers 1.5 games ahead of Dallas for second place in the Western Conference, and two games ahead in the loss column. They also hold the tiebreaker having beaten Dallas 2-1 this season. They are also only 2.5 games behind the San Antonio Spurs for first in the West after Boston’s 107-97 in San Antonio Thursday. The Lakers play tomorrow night in Utah against the struggling Jazz, having just finished a 7-0 homestand. They’ll return back to Staples Center for a Sunday for an afternoon game against the surging Denver Nuggets. 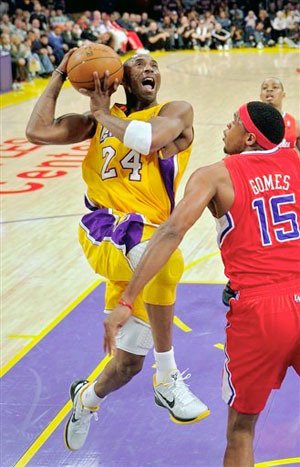 Kobe Bryant drives hard to basket against Clippers. It wasn’t a blowout, but the Lakers led wire-to-wire as they held off the Clippers 112-104 Friday night at Staples Center, to push their post-All-Star game record to 14-1. Kobe Bryant had a game-high 37 points, coming off his season-high 42 points against Phoenix on Tuesday. He hit 11-21 shots from the field, and went to the line 17 times, connecting on 14 of them. He also had six and assists and four rebounds, and scored 12 points in the fourth quarter. Pau Gasol, who scored 26 points and had eight rebounds, raised $26,000 for Japan relief as he donated $1,000 for every point he scored in the game. Ron Artest had 15 points, five rebounds, three blocks, three steals, and played superb defense all night on the Clippers’ leading-scorer Eric Gordon, holding him to seven points on 3-14 from the field. The Lakers jumped out fast on the Clips, taking a 30-14 lead late the in the first quarter. The Clippers rallied in the second quarter and closed to 37-35, but never did get any closer in the first half. The champs led at the break 57-48. In the second half, the Lakers continued to maintain a healthy lead, pulling ahead by 12 on several occasions, only to see their hallway neighbors continue to battle back. After three the Lakers only led 85-80. The Clippers kept it close in the fourth, closing the gap to two on several possessions. With Lakers leading by four with 40 seconds left, Artest made a great defensive play in the open court, taking the ball away from rookie sensation Blake Griffin who was heading in for a dunk. 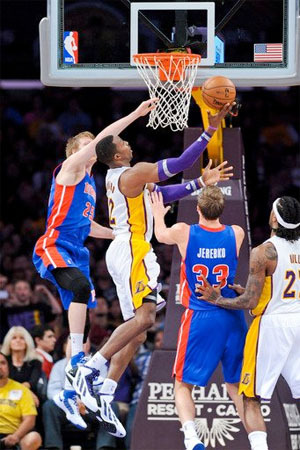 The game was sealed when Andrew Bynum tipped in a missed Derek Fisher free throw with under 20 seconds left. Tempers flared again for the two teams, as Fisher and Clipper center got into a yelling match when Fisher threw out his elbow after a hard screen set on him by Kaman, in the final seconds. Kaman appeared to tell Fisher he’d meet him in the parking lot after the game, as he was being ejected with two technical fouls. Fisher was also assessed a technical. Both teams shot the ball well from the floor. The Lakers hit 50.0% (39-78) and the Clippers also hit half of their shots (42-84). Neither team shot the three ball well, the Lakers went 6-18 (33.3%) and the Clips 5-17 (29.4%) One of the big differences in the game was the Lakers going to the line 39 times, hitting 28, while the Clippers went 15-18 from the charity stripe. The Lakers won the rebound battle, 41-34, and committed two less turnovers at 16-14. For the Clippers, Mo Williams had a season-high 30 points and six assists, hitting 11-16 from the floor and 4-7 from the three-point line. Griffin had a fairly quiet 22 points and only six rebounds, but did have a few highlight dunks, which as become the norm for him nightly. Randy Foye had 12 off the bench, and Al-Farouq Aminu scored 11 points off the bench as well. The Lakers moved their record to 52-20 as they won their sixth straight, and now lead the Dallas Mavericks by 1.5 games for second place in the Western Conference standings. They also only trail the San Antonio Spurs by 5.0 games with 10 left to play. They won their eighth straight game at Staples, and took the season series against the Clippers 3-1. Los Angeles tries to continue their undefeated homestand against the New Orleans Hornets on Sunday. The Hornets lost their leading-scorer David West to a torn ACL this week, so they will rely much more on All-Star point guard Chris Paul to pick up the scoring slack, as they battle for playoff position in the West. The Hornets are currently in seventh place in the conference.